Cell-cell communication is an important factor in feto-maternal units during placentogenesis. The placenta produces pivotal hormones and cytokines for communication between cotyledonary villi and the maternal caruncle. Gene expression in bovine placenta throughout pregnancy was comprehensively screened by a cDNA microarray, and we searched for a common transcription factor in a gene cluster that showed increasing expression throughout gestation in cotyledonary villi and caruncle. Placentomal tissues (villi and caruncle) were collected from Day 25 to Day 250 of gestation for microarray analysis. Global gene expression profiles were analyzed using the k-means clustering method. A consensus sequence cis-element that may control up-regulated genes in a characteristic cluster was examined in silico. The quantitative expression and localization of a specific transcription factor were investigated in each tissue using quantitative real-time RT-PCR and in situ hybridization. The microarray expression profiles were classified into ten clusters. The genes with most markedly increased expression became concentrated in cluster 2 as gestation proceeded. Cluster 2 included placental lactogen (CSH1), pregnancy-associated glycoprotein-1 (PAG1), and sulfotransferase family 1E estrogen-preferring member 1 (SULT1E1), which were mainly detected in giant trophoblast binucleate cells (BNC). Consensus sequence analysis identified transcription factor AP-2 binding sites in some genes in this cluster. Quantitative real-time RT-PCR analysis confirmed that high level expression of transcription factor AP-2 alpha (TFAP2A) was common to cluster 2 genes during gestation. In contrast, the expression level of another AP-2 family gene, transcription factor AP-2 beta (TFAP2B), was extremely low over the same period. Another gene of the family, transcription factor AP-2 gamma (TFAP2C), was expressed at medium level compared with TFAP2A and TFAP2B. In situ hybridization showed that TFAP2A, TFAP2B and TFAP2C mRNAs were localized in trophoblast cells but were expressed by different cells. TFAP2A was expressed in cotyledonary epithelial cells including BNC, TFAP2B was specifically expressed in BNC, and TFAP2C in mononucleate cells. The placenta that connects the mother to the fetus plays a crucial role in mammalian fetal growth and maintenance of the pregnancy. The mechanisms of implantation, placentation, fetogenesis and delivery are unclear because the complicated cell-cell communication involved is modulated by hormones, cytokines and growth factors. At each stage in gestation, intricate molecular and biochemical regulation is involved in maintaining the fetal-maternal relationship. Placentomes consisting of fetal and maternal tissues, namely cotyledons and caruncles, develop step-by-step during gestation in cattle . The giant trophoblast binucleate cells (BNC) characteristically appear early in gestation and represent approximately 20% of trophoblast cells throughout gestation in the bovine placenta . BNCs participate directly in modifying the endometrial epithelium, beginning at implantation and continuing until term, and play a major role in feto-maternal communication in ruminants . Although BNCs are known to produce various specific molecules – prolactin-like hormones, pregnancy-associated glycoproteins (PAG), steroid hormones and prostanoids, thus acting as endocrine cells [1, 3] – the regulatory mechanisms common to the expression of these molecules remain to be investigated. Analyses of global gene expression profiling reveal a new aspect of the intricate molecular mechanisms in the bovine placenta. Even with new technology, analysis of enormous amounts of genetic information reveals a highly complex situation. We have examined the following gene expression profiles: (i) global gene expression in the placenta, mainly in the caruncle or endometrium in early pregnancy, in order to investigate the genes involved in placentation ; (ii) global gene expression in the embryo and extra-embryonic membranes during the implantation period ; and (iii) trophoblast cell-specific gene expression in a bovine trophoblast cell line (BT-1)  using a custom-made cDNA microarray. Other groups have also studied global gene expression in ruminants using cDNA arrays during the pre- or peri-implantation period, specifically in the 8-cell bovine embryo , gastrulation , implantation  and endometrium [10–12]. Microarray analysis gives information about thousands or tens of thousands of genes simultaneously and suggests biological pathways in organs and cells. However, it is difficult to establish correlations among genes within one gene cluster; gene expression data tend to fluctuate because there is still insufficient information about the bovine genome. A common transcription factor may be utilized for genes in identical clusters with very similar expression patterns . Currently, bioinformatics methods allow genome-wide expression of transcriptional regulatory elements to be analyzed rapidly in humans and/or yeast [14–19]. It would be interesting to identify a common response regulator of the principal genes in the placenta; this could elucidate the mechanism of placentation and the properties of BNC. Here, we investigated global gene expression within the placenta from the initial to the late stages of pregnancy, in order to identify the genes related to placentation and placental maintenance. After microarray analysis, a possible common response regulator for trophoblast-cell functions and the maintenance of gestation was examined by in silico analysis, using information about the bovine genome, quantitative real-time RT-PCR (QPCR) and in situ hybridization. Placentomal tissues for mRNA expression were collected from Japanese Black cows. The necessary extra-embryonic membranes, placenta and endometrium were collected at a local slaughterhouse on days 25 to 28, 56 to 64, 144 to 149 and 245 to 252 after artificial insemination (Day 0) and on Day 13 of the estrus cycle (non-pregnant). The tissues were separated into two portions, the cotyledonary villous (COT) and the caruncle areas (CAR), the latter including the maternal placentomal septa in the endometrium. It was difficult to separate the COT from the fetal membranes on days 25 to 28, as the extra-embryonic membrane (EEM) contained very few villi. Tissue taken from three different cows on days 25, 27 and 28 of gestation (n = 2 animals for the microarray; n = 3 animals for QPCR) was designated Day 25 EEM; Day 25 endometrium was designated Day 25 ENDO. Placentomal tissues were collected on days 56 (two animals), 64 and 65 (totally n = 3 animals for the microarray; n = 4 animals for QPCR) and were designated Day 60 COT and Day 60 CAR. Sample materials from days 144, 148 and 149 (n = 2 animals for the microarray; n = 3 animals for QPCR) and days 245 (two animals), 249 and 252 (totally n = 2 animals for the microarray; n = 4 animals for QPCR) were respectively marked Day 150 COT, Day 150 CAR, Day 250 COT and Day 250 CAR. The cotyledonary and caruncular parts were mechanically separated, with each part containing some of the tissue. Two samples from non-pregnant cows were collected for the microarray. The collected samples were stored at -80°C prior to RNA extraction, and additional placentomes from Day 56 were fixed in 3.7% formaldehyde PBS at pH 7.4 and then embedded in paraffin wax and stored at 4°C prior to in situ hybridization. All procedures for these animal experiments were carried out in accordance with guidelines approved by the Animal Ethics Committee of the National Institute of Agrobiological Sciences for the use of animals. Total RNA was individually isolated from ENDO, CAR, EEM and COT using ISOGEN (NipponGene, Toyama, Japan) according to the manufacturer's instructions. Poly (A)+ RNA was prepared from the total RNA using an Oligotex-dT30 Super mRNA isolation kit (JSR, Tokyo, Japan). The extracted poly (A)+ RNA was used for the cDNA microarray experiment. A custom-made utero-placental cDNA microarray developed in our laboratory [4, 20] was used. A total of 3955 clones were spotted on one chip; 1780 individual genes were annotated by BLASTn. The details of the cDNA microarray experiments were described in previous reports [4, 5]. cDNA microarray hybridization was performed as described previously [4, 5]. Poly(A)+ RNA was reverse-transcribed with Cy3 or Cy5 fluorescent dye (Amersham Biosciences, Buckinghamshire, UK) using SuperScript II reverse transcriptase (Invitrogen, Carlsbad, CA, USA) to make the hybridization probes. The labeled probes were concentrated in a Microcon filter (Millipore, Bendford, MA, USA), diluted in hybridization solution (a mixture of SSC, SDS, poly(A) and yeast tRNA), and applied to the microarray. After incubation at 65°C, the array chips were sequentially washed with SSC/SDS solution and SSC solution. The hybridization images were scanned using a GenePix 4000B (Axon Instrument, Union City, CA, USA) and analyzed by the GenePix Pro 4.0 program. Sample hybridizations were performed in duplicate for all samples. The COT and CAR samples from the pregnant cows were reverse-labeled. In the reverse labeling procedure, for example, the cDNAs for COT of Day 60 and CAR of Day 60, which had initially been labeled with the fluorescent dyes Cy3 and Cy5, respectively, were then labeled with Cy5 and Cy3, respectively. The two endometrial samples were self-labeled; for example, the ENDO cDNA samples were labeled with Cy3 or Cy5, respectively, and both labeled cDNA were mixed and hybridized on the microarray. Each data point was individually normalized and the average value was used for data analysis. Data were normalized by the following procedures [5, 21]. The local background intensity of each spot was smoothed by a local weight regression (lowess) smoother and subtracted from the feature intensity data. The subtracted intensity data were subjected to non-parametric regression and local variance normalization. Non-parametric regression can reduce intensity-dependent biases. Compared with linear regression, the accuracy is improved as long as the points in the scatter plot of Cy3 vs. Cy5 are not distributed around a straight line. Normalization of local variance controlled most of the background in low-intensity data, whereas the normalized data, in many cases, showed no significant fold-differences in comparison with the background-subtracted raw intensity ratios, which frequently indicated higher fold-differences. Thus, the variance method employing bovine utero-placental array data produced highly reliable normalized ratios. Compliance with Minimum Information About a Microarray Experiment (MIAME)  was assured by depositing all the data in the Gene Expression Omnibus (GEO) repository . The GEO accession numbers are as follows. Platform: GPL1221; Samples: GSM170629, GSM170632, GSM170636, GSM170637, GSM170638, GSM170639, GSM170640, GSM170641, GSM170642, GSM170643, GSM170644, GSM170645, GSM170655, GSM170679, GSM170687, GSM170688, GSM170689, and GSM170690; Series: GSE7096. The data for individual genes were obtained by averaging the corresponding spots on the microarray. The transformed log2 values were used for cluster analysis. The TIGR MultiExperiment Viewer 3.0 (MeV 3.0) program was used for k-means cluster analysis [24, 25]. The general expression patterns of the 1446 unique genes, except for unreliable low-expression genes, were investigated using the k-means algorithm. The data for each gene were represented by an eight-dimensional vector. K-means clustering was performed by partitioning around 10 centroids. The distances between the gene vectors were calculated using the cosine coefficient (vector angle). We searched for a transcription factor consensus binding site common to all genes in cluster 2, because the microarray analysis revealed the most marked changes in this cluster. We obtained a region 200 bp upstream from each gene from Map Viewer on the NCBI web site . 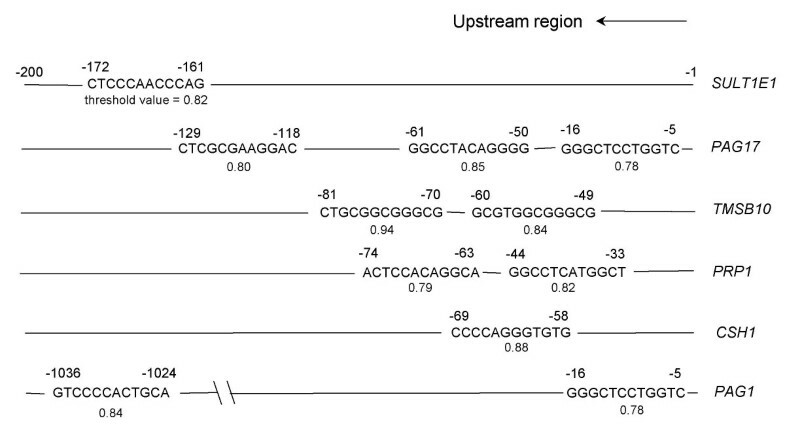 We searched for a transcription factor binding site common to these upstream regions using the TFBIND program [27, 28]. We investigated the mRNA expression patterns of (i) six characteristic genes selected from the microarray analysis (Annexin I (ANXA1), RNA polymerase II carboxy-terminal domain small phosphatase 2 (CTDSP2), Msh homeo box 1 (MSX1), Heat shock 70 kDa protein 1A (HSPA1A), Heat shock 70 kDa protein 8 (HSPA8) and Sulfotransferase family 1E estrogen-preferring member 1 (SULT1E1)), and (ii) transcription factors for which consensus binding sites were present in multiple members of cluster 2, namely transcription factors AP-2 alpha (TFAP2A), AP-2 beta (TFAP2B) and AP-2 gamma (TFAP2C). Real-time RT-PCR was performed using the SYBR Green Detection System (Applied Biosystems, Foster City, CA, USA). Fifty nanograms of total RNA was reverse-transcribed for 30 min at 48°C by MultiScribe™ reverse transcriptase with a random primer, dNTP mixture, MgCl2 and RNase inhibitor. After heat inactivation of the reverse transcriptase for 5 min at 95°C, PCR and the resulting relative increase in reporter fluorescent dye emission were monitored in real time using an Mx3000P QPCR system (Stratagene, La Jolla, CA, USA). The primer pair was designed by the Primer Express Program (Applied Biosystems). The primers for each gene are listed in Table 1. The thermal cycling conditions included one cycle at 50°C for 2 min, one cycle at 95°C for 10 min, and 40 cycles at 95°C for 15 s and 60°C for 1 min. The relative difference in the initial amount of each mRNA species (or cDNA) was determined by comparing the CT values. To quantify the mRNA concentrations, standard curves for each gene were generated by serial dilution of the plasmid containing its cDNA. We confirmed the melting curve for detecting the SYBR Green-based objective amplicon because SYBR Green also detects double-stranded DNA including primer dimers, contaminating DNA and PCR products from misannealed primers. Contaminating DNA or primer dimers appear as a peak separate from the desired amplicon peak. The expression ratio of each gene to GAPDH mRNA was calculated to adjust for variations in the RT-PCR reaction. All values are presented as mean ± SEM. QPCR was duplicated on one animal sample. To be more precise: for the Day25 and Day150 samples, QPCR data were collected from 3 animals (biological replicates) and the technique was repeated for one animal sample (technical duplicate); in total, six data were obtained. For QPCR data from the Day60 and Day250 samples, 4 biological replicates were obtained and technical duplicate was performed on one sample (eight data in total). One-way ANOVA followed by the Tukey-Kramer multiple comparison test was used for statistical analysis. Differences were considered significant at P < 0.05. Approximately 500 bp cDNA of a representative cluster 2 gene, SULT1E1, and of the genes commonly utilized in the cluster, TFAP2A, TFAP2B and TFAP2C, was used as template for synthesizing a hybridization probe. Digoxigenin (DIG)-labeled anti-sense and sense cRNA probes were prepared as described in previous studies [29–31]. Day 56 bovine placentomes were sectioned into 7 μm-thick sections. In situ hybridization was performed using an automated Ventana HX System Discovery with a RiboMapKit and a BlueMapKit (Ventana, Tucson, AZ, USA) [29–31]. Briefly, the sections were hybridized with DIG-labeled probes in RiboHybe (Ventana) hybridization solution at 63°C (SULT1E1 and TFAP2A) or 61°C (TFAP2B and TFAP2C) for 6 hours, then washed for 3 × 6 min in RiboWash (Ventana) at 65°C and fixed in RiboFix (Ventana) at 37°C, 10 min. The SULT1E1 and TFAP2A hybridization signals were detected using a monoclonal-anti-digoxin biotin conjugate (Sigma, Saint Louis, MI, USA). The TFAP2B and TFAP2C hybridization signals were detected with a rabbit polyclonal anti-digoxin HRP conjugate (Dako Cytomation, Carpinteria, CA, USA) using an AmpMapKit (Ventana). After preparation, the hybridized slides were observed with a Leica DMRE HC microscope (Leica Microsystems, Wetzlar, Germany) and a Fujix digital camera HC2500 (Fujifilm, Tokyo Japan). We examined the correlations of microarray data among tissues at corresponding stages of pregnancy (Table 2). The correlations for non-pregnant (n = 2 animals), Day25 (n = 2 animals), Day60 (n = 3 animals), Day150 (n = 2 animals) and Day250 (n = 2 animals) samples were calculated in the biological replicates and technical duplicates by reverse labeling. The correlation coefficients between the two sets of Day 25 and the three sets of Day 60 data are high. This is also true for the two sets of Day 150, Day 250 and non-pregnant data. Therefore we used the averages of the two data sets for each of these stages of gestation. The correlation coefficients (r) between the same stage of microarray data. The correlations of non-pregnant, Day25, Day150, and Day250 samples were calculated at biological duplicate n = 2 and technical duplicate by reverse labeling n = 2. The correlations of Day60 samples were calculated at biological duplicate n = 3 and technical duplicate by reverse labeling n = 3. Differences were considered significant at P < 0.05. Three hundred and twenty genes out of a total of 1780 were excluded from cluster analysis because of their low expression values. The remaining 1446 genes were partitioned into ten categories by k-means clustering, as depicted in Fig. 1. 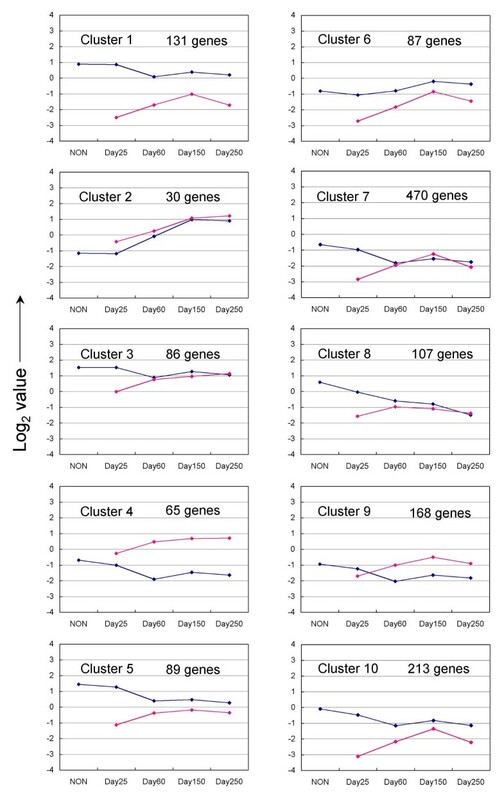 The ten k-means cluster profiles were classified into three types: (i) profiles with COT gene-expression intensities higher than those of CAR from Day 60 to Day 250 of gestation (clusters 4 and 9); (ii) those with expression intensities in COT level similar to those of CAR in clusters 2, 3, 7 and 8; and (iii) those with CAR expression intensities higher than those of COT (clusters 1, 5, 6 and 10). The number of genes in each cluster ranged from about 500 to 30. Specifically, cluster 7 contained 470 genes, whereas cluster 2 contained only 30 genes. K -means clusters of the gene expression pattern from non-pregnant ENDO to Day 250 CAR and Day 25 EEM to Day 250 COT. The 1446 unique genes except for the genes that exhibited low expression intensity were subjected to clustering analysis. The blue line shows to the k-means center of gene expression on ENDO to CAR. The pink line shows to the k-means center of gene expression on EEM to COT. The expression intensity refers log2 value of normalized data. Cluster 1 comprised 131 genes including numerous ribosomal proteins, osteonectin (SPARC), decorin (DCN), cytochrome-c oxidase subunit V and Rho GDP dissociation inhibitor beta (ARHGDIB). The expression intensities were high in the ENDO-CAR tissues in non-pregnant subjects and declined slightly until Day 60, after which they remained more or less constant until Day 250. In contrast, the expression level was low in EEM-COT tissues on Day 25 and increased up to Day 150. In cluster 2, the expression intensity increased from Day 25 to Day 150 in both ENDO-CAR and EEM-COT. Cluster 2 comprised only 30 genes including placental lactogen (CSH1), prolactin-related proteins (PRPs), PAGs and SULT1E1. In cluster 3, gene expression intensities were high in ENDO-CAR and EEM-COT. Expression decreased slightly from non-pregnant to Day 60 in CAR, but increased markedly in EEM-COT from Day 25 to Day 60 and continued to increase gradually up to Day 250. Cluster 3 included 86 genes, mainly cytoskeleton and cell adhesion genes such as beta-actin (ACTB), alpha-tubulin (TUBA), tropomyosin 2 (TPM2), Villin 2 (VIL2, ezrin) and chloride-channel calcium-activated family member 3 (CLCA3, Lu-ECAM-1). In cluster 4, the profiles of gene expression intensities in EEM-COT and ENDO-CAR were opposite; the intensities increased slightly from Day 25 to Day 250 in EEM-COT, but declined slightly from non-pregnant ENDO to Day 250 in CAR. This cluster included 65 genes such as alpha-lactalbumin (LALBA), aldose reductase (AKR1B1), the insulin-like growth factor II (IGF2), HSPA1A, HSPA8, and heat shock 27 kDa protein 1 (HSPB1). In cluster 5, the gene expression intensity was higher in ENDO than in EEM. Cluster 5 included 89 genes such as type III and XII collagens, Calbindin 3 (CALB3), tissue inhibitor metalloproteinase 2 (TIMP2), and trophoblast Kunitz domain protein 5 (TKDP5). In cluster 6, the expression intensity was low in both ENDO-CAR and EEM-COT. The intensity increased from Day 25 to Day 150. In contrast, the intensity increased markedly from Day 25 to Day 150 and then declined to Day 250. Cluster 6 included 87 genes such as fibronectin (FN1), coronin actin-binding protein 2A (CORO2A), profilin 1 (PFN1), an inhibitor of metalloproteinase 1 (TIMP1), the insulin-like growth factor binding protein-3 (IGFBP3), the macrophage migration inhibitory factor (MIF) and heat shock 90 kDa protein (HSP90). In cluster 7, expression was low in both ENDO-CAR and EEM-COT. The intensity declined further to Day 60 and then remained steady up to Day 250. In contrast, the expression intensity in EEM-COT increased significantly from Day 25 to Day 150. Cluster 7 comprised the largest number of genes (470), including 11-beta hydroxysteroid dehydrogenase 2 (HSD11B2), Annexin II (ANXA2), vinculin (VCL), alpha E-catenin (CTNNA1), mucin (MUC1), RNA polymerase II carboxy-terminal domain small phosphatase 2 (CTDSP2), Msh homeo box 1 (MSX1), vascular endothelial growth factor (VEGF) and VEGFB. In cluster 8, the initially rather high intensity in ENDO-CAR decreased throughout the examination period. In contrast the initially low expression intensity in EEM-COT showed a slight increase from Day 25 to Day 60, then decreased slightly up to Day 250. Cluster 8 included 108 genes, such as extracellular matrix (ECM) related genes, type I collagen alpha 2 (COL1A 2), matrix Gla protein (MGP), laminin beta 1 (LAMB1), clusterin (CLU) and uterine milk protein (UMP). In cluster 9, low expression intensities were found in ENDO-CAR and EEM-COT. The expression in ENDO-CAR declined to Day 250. In contrast, it increased slightly in EEM-COT from Day 25 to Day 150 and then decreased to Day 250. This cluster included 168 genes such as stanniocalcin (STC1), growth hormone receptor (GHR), selectin L (SELL), glycoprotein-4-beta-galactosyltransferase 2 (B4GALT1), annexin I (ANXA1) and cathepsin L (CTSL). In cluster 10, expression was low in ENDO-CAR, with the intensity decreasing slightly from non-pregnant to Day 250. An extremely low initial intensity was detected in EEM-COT but this increased greatly from Day 25 to Day 150. Cluster 10 included 213 genes such as S100 calcium binding protein A11 (S100A11), apolipoprotein D (APOD), cytochrome P450 family 11, subfamily A polypeptide 1 (CYP11A1) and matrix metalloproteinase 2 (MMP2). The 10 genes representative of the individual clusters are listed in Table 3. We selected dominant genes for which the expression level was known during the implantation, placentation or embryogenesis stages in other species [32–38]: ANXA1 from Cluster 9, MSX1 and CTDSP2 from Cluster 7, HSPAs (1A and 8) from Cluster 4 and SULT1E1 from Cluster 2. These data are shown in Fig. 2. In CAR, the microarray data for ANXA1, HSPA1A and HSPA8 were weak relative to the QPCR value. For CTDSP2, MSX1 and SULT1E1, the QPCR values clearly reflected the microarray data. In general, the QPCR results were consistent with the microarray analysis results. QPCR analysis and normalized microarray data of ANXA1 , CTDSP2 , MSX1 , HSPA1A , HSPA8 , and SULT1E1 mRNA at each stage of bovine tissue (ENDO, CAR, EEM, COT). The gene expressions on Days 25 ENDO (n = 3), 60 CAR (n = 4), 150 CAR (n = 3), 250 CAR (n = 4), 25 EEM (n = 3), 60 CAR (n = 4), 150 CAR (n = 3), and 250 CAR (n = 4) are shown. The QPCR expression of these genes was normalized to the expression of GAPDH measured in the same RNA preparation. The pink bar shows gene expression on fetal side (EEM to COT) by QPCR. The blue bar shows gene expression on maternal side (ENDO to CAR) by QPCR. The yellow line shows normalized value of the microarray. Values are means ± SEM. Values with different letters are significantly different (P < 0.05). Cluster 2 contained genes with expression intensities that were strong and up-regulated during gestation. This cluster contained many placenta-specific genes such as CSH1, PRPs and PAGs. The transcription factor that commonly regulates these genes is expected to have a pivotal role in the bovine placenta. Some genes were selected from cluster 2 in order to search for the cis-element. They were CSH1, PAG1, PAG17, PRP1, SULT1E1 and thymosin β10 (TMSB10), all selected by MapView from the NCBI web site. A transcription factor binding site common to the six upstream region sequences was examined in these genes using TFBIND software . We found that the six sequences had AP-2 binding sites within 200 bp upstream of the transcription start (Fig. 3). Potential AP-2 binding site in upstream region (-200 to -1) of principal genes in cluster 2, identified by TFBIND software. The AP-2 consensus sequence is "MKCCCSCNGGCG" (M = A/C/G; K = A/G/T; S = G/C; N = A/G/C/T) from TRANSFAC databases. The threshold value exhibits homology with the above consensus sequence. "1" represents perfect coincidence with the consensus sequence. Most of cluster 2-specific genes such as CSH1, PRP1 and PAG1 are mainly expressed in BNC, as previously reported [29, 30, 39–43]. SULT1E1 was also expressed in BNC (Fig. 4). Localization of SULT1E1 mRNA in a bovine placentome on Day 56 of gestation. SULT1E1 mRNA was detected by in situ hybridization. (A) DIG-labeled anti-sense cRNA probes were used. (B) DIG-labeled sense cRNA probes were used. Seven-micrometer sections of bovine placentome were hybridized with each probe. Scale bar = 20 μm. CaE: caruncular epithelium. CaS: caruncular stroma. CoE: cotyledonary epithelium. BNC: binucleate cell. The QPCR results are presented in Fig. 5. In EEM-COT, expression of TFAP2A increased from Day 25 to Day 60 and maintained a constant level up to the late stage of pregnancy. In ENDO-CAR, expression of this gene increased as gestation progressed, but the intensity in EEM-COT was higher than in ENDO-CAR at all stages. 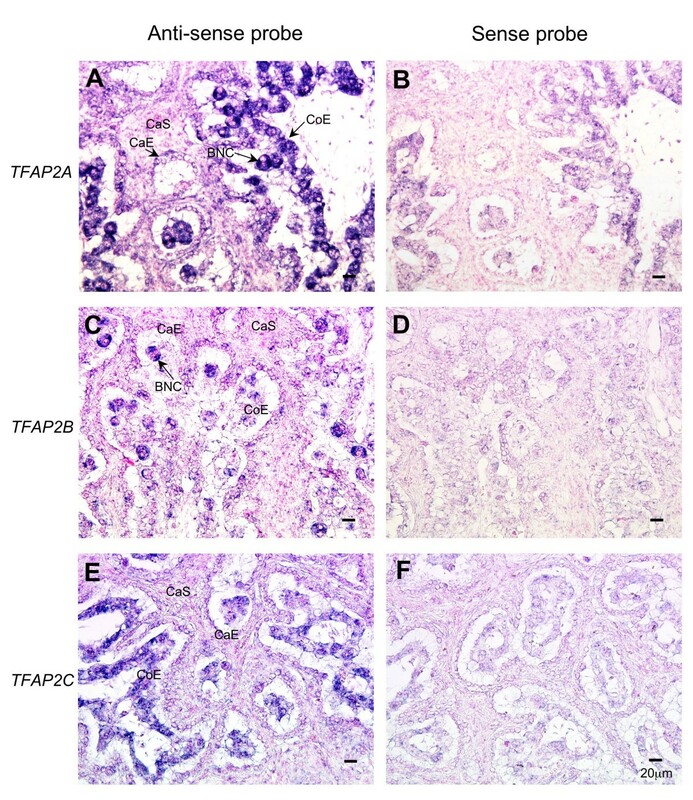 TFAP2B was expressed throughout gestation in both ENDO-CAR and EEM-COT. TFAP2C expression was low in ENDO-CAR and EEM-COT, but increased late in pregnancy. TFAP2A was more highly expressed than TFAP2B or TFAP2C. QPCR analysis of TFAP2A , TFAP2B , and TFAP2C mRNA at each stage of bovine tissue (ENDO, CAR, EEM, COT). The gene expression on Days 25 ENDO (n = 3), 60 CAR (n = 4), 150 CAR (n = 3), 250 CAR (n = 4), 25 EEM (n = 3), 60 CAR (n = 4), 150 CAR (n = 3), and 250 CAR (n = 4) are shown. The expression of these genes was normalized to the expression of GAPDH measured in the same RNA preparation. The pink bar shows gene expression on fetal side (EEM to COT) by QPCR. The blue bar shows gene expression on maternal side (ENDO to CAR) by QPCR. Values are means ± SEM. Values with different letters are significantly different (P < 0.05). The cells expressing the AP-2 family were identified by in situ hybridization in the bovine placentome on Day 60 of gestation (Fig. 6). DIG-labeled TFAP2A, TFAP2B and TFAP2C anti-sense RNA probes specifically detected the mRNA transcripts in the placentome. TFAP2A appeared mainly in the cotyledonary villous epithelium (Fig. 6A). The principal expressing cells were in the cotyledonary villous epithelium, including the BNC. TFAP2B was specifically expressed in the BNC of cotyledonary villi (Fig. 6C). TFAP2C was specifically expressed in trophoblast mononucleate cells of the cotyledonary villi (Fig. 6E). No significant signals for any gene were detected with sense probes (Figs. 6B, D and 6F). Localization of TFAP2A , TFAP2B , and TFAP2C mRNA in the bovine placentome on Day 56 of gestation. TFAP2A (A, B), TFAP2B (C, D) and TFAP2C (E, F) mRNA were detected by in situ hybridization. (A, C, E) DIG-labeled anti-sense cRNA probes were used. (B, D, F) DIG-labeled sense cRNA probes were used. Seven-micrometer sections of bovine placentome were hybridized with each probe. Scale bar = 20 μm. CaE: caruncular epithelium. CaS: caruncular stroma. CoE: cotyledonary epithelium. BNC: binucleate cell. Placental and trophoblast gene expression profiles depend on the cells and tissues, as well as the period of gestation. Diverse expression profiles have been reported and spatially and temporally different expressions have been observed in bovine placentomes [4, 5]. However, global gene profiles have not been available for the whole of gestation in bovine placenta. In previous studies, specific expression of genes in trophoblast cells, such as CSH1, PRPs and PAGs in BNC, has been noted because of marked changes in expression level [29, 30, 39–44]. In the present study, placentomal gene expression profiles during gestation were analyzed for their intensities and patterns. The factors proactive in regulating gene expression were also examined. The most marked changes were found in genes related to trophoblast cells, as in previous reports [4, 5]. In Cluster 2, the expression intensities of CSH1, PAGs, PRPs, SULT1E1, TMSB10 and others increased as gestation progressed. These genes are known to be among the crucial factors for implantation, placentation and the maintenance of gestation in cattle [30, 40–42, 44]. Various ECM-related genes expressed in the endometrium declined from the early to the late stages of pregnancy. 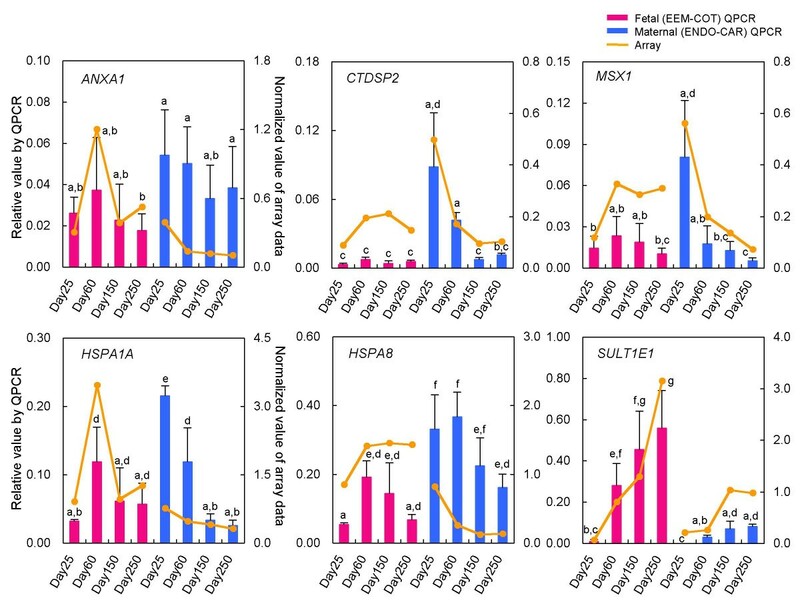 Cluster 8 comprised ECM-related genes and proteinases and their inhibitors, such as COL1A 2, MGP, LAMB1, CLU, CST3 and CTSB. Many of these may also play important roles in maintaining gestation and may be expressed specifically in the endometrium [4, 45–47]. The genes in this cluster may mostly have specific roles in remodeling the endometrium throughout gestation, especially during implantation and placentation. In mice, both the cysteine proteinase CTSB and its inhibitor CST3 are expressed in the placenta; they are important in remodeling the ECM and forming the decidua . These global gene expression data suggest that the genes grouped in the same cluster are related not only in showing a similar expression pattern, but also in having similar or opposite functions. For example, COL1A2, MGP, LAMB1 and CLU in cluster 8 have ECM-related functions. In contrast, CTSB and its inhibitor CST3, also expressed in cluster 8, have opposite functions. The global gene expression profiles in the present microarray study were confirmed by QPCR using selected genes (ANXA1, CTDSP2, HSPA1A, HSPA8, MSX1 and SULT1E1). The comparatively high reliability of the microarray data was confirmed by QPCR, as well as by previous studies [4–6]. These selected genes may have a central role in placental formation and function; it is suggested that ANXA1 inhibits inflammation in the human placenta . CTDSP2 is the enzyme that dephosphorylates the C-terminal domain (CTD) of RNA polymerase II . Unexpectedly, CTD phosphorylation was found not to be essential for RNA polymerase II-mediated transcription in mouse trophoblast giant cells . Members of the HSPA family are expressed constantly throughout pregnancy until parturition in human placenta  in cytotrophoblast, syncytiotrophoblast, intermediate trophoblast and endothelial cells . MSX1 is regulated by the leukemia inhibitory factor (LIF) or ovarian steroid hormones (estrogen and progesterone) in mouse endometrium specifically during the implantation period, and its expression decreased as implantation progressed . SULT1E1 regulates active estrogen and is active in mid to late pregnancy . A microarray can be used to collect the vast amount of data related to expression profiling and to monitor the expression levels of thousands of genes simultaneously. One of the goals of this work was to discover the transcription factors common to the regulation of gene expression during bovine reproduction [4, 49]. We also examined whether the microarray results suggest a regulatory cascade of gene expression. Cluster 2 genes exhibited a characteristic expression pattern, increasing from the early to the late stage of pregnancy. This increase in gene expression suggests functional and morphological developments of the placentomes. Microarray analysis can be used as an exploratory tool for understanding the biological functions of placental cells. A genome-wide analysis of a common transcription factor is one approach to utilizing microarray data effectively. In silico research involving the search for a common transcription factor by microarray data analysis has been reported [14–19]. We searched for a common regulatory element in the cluster in which the bovine trophoblast cell-specific genes appear using the TFBIND program . The results indicated that an AP-2 binding site is common to the upstream (promoter) regions of the principal genes in cluster 2 (Fig. 3). It is known that the AP-2 family plays a role in the differentiation and proliferation of mouse, human and ovine trophoblast cells [50–54]. Embryos of TFAP2C-deficient mice die during the middle stage of development, suggesting that trophectodermal cells cannot proliferate in a TFAP2C-deficient mouse [51, 52]. This research was mainly carried out using cultured human cells in which placental-specific genes such as hCSH1, human chorionic gonadotropin (hCG) and human corticotropin-releasing hormone (hCRH) are regulated by the AP-2 family [53, 54]. There are some reports on the regulation of placenta-essential genes by the AP-2 family. Adenosine deaminase (ADA) is a purine metabolism enzyme that is enriched in trophoblast cells in the murine placenta. Studies on ADA-deficient mice have demonstrated that the absence of ADA from trophoblast cells is associated with perinatal lethality [55, 56]. This gene is regulated by TFAP2C [51, 57]. hCG is a placenta-specific gene in the human placenta and the expression of hCGα or hCGβ is also regulated by TFAP2A or TFAP2C [54, 58–61]. CSH1, a gene with trophoblast cell-specific expression, is regulated by TFAP2A or TFAP2C in mouse, rat, human and sheep [62–65]. The binding site for AP-2 in CSH1 was identical to the site specified for ovine CSH1 [50, 65]. The binding site in the bovine gene may again be similar because the upstream sequences in the orthologous genes resemble each other. An AP-2 binding site has also been reported in the promoter regions of mouse, rat and human CSH1 [54, 63, 64]. It is anticipated that TMSB10 and SULT1E1, which are expressed at high levels in the placenta, are similarly regulated by the AP-2 family, as determined by TFBIND analysis. In PRP1, the existence of an AP-2 binding site in the enhancer region (-1215 to -1204) has been reported, and the AP-2 family is predicted to bind at this site . In our results, two AP-2 binding sites were newly confirmed by the TFBIND search at -74 to -63 and -44 to -33. AP-2 binding sites in the PAG17 promoter region were confirmed at three positions (Fig. 3). However, an AP-2 binding site in the PAG1 promoter region was confirmed only at -16 to -5 (Fig. 3) . General transcription factors may occupy this site. AP-2 binding sites were also confirmed in the PAG1 enhancer region (-1026 to -1024) by a TFBIND search. It was possible to predict the integrated regulatory elements of gene clusters that specifically appeared in the trophoblast. Integrated transcriptional regulator analysis may be of value for investigating gene cascades on a genome-wide level. The AP-2 family has splice variants. Three of these, TFAP2A, TFAP2B and TFAP2C, were examined in the present study to determine their expression intensities and locations. AP-2 genes were expressed mainly in the COT epithelium along with CSH1, PRP1, PAG1 and BCL2-related protein A1 (BCL2A1) [29, 31, 42, 43]. However, localization of the expressing cells was dependent on the type of AP-2 variant. TFAP2A was confirmed in BNC and mononucleate cells. TFAP2B was confirmed in only BNC but its expression level was extremely low. TFAP2C was confirmed in trophoblast mononucleate cells an expression level mid-way between those of TFAP2A and TFAP2B (Fig. 6). These results suggest that this gene family may have different roles in the differentiation and proliferation of trophoblasts. In murine and human placenta, TFAP2C was found to be the most highly expressed of the AP-2 family; TFAP2A was detected in the trophoblast cell lineage (giant cells and cytotrophoblast cells), but TFAP2B was not completely confirmed [54, 57]. CSH1 is specifically expressed in trophoblast giant cells in rodents, in syncytial trophoblast in humans and in BNC in ruminants . Previous studies and the present study clearly suggest that the AP-2 family is a principal factor in regulating CSH1 functions in rodents and humans [54, 62–65]. The present study also suggests that AP-2 regulates cytochrome P450-related genes for producing steroid hormones in bovine placental BNC [69, 70]. Steroid hormone production and cytochrome P450 and SULT1E1 expression may also be linked by AP-2 regulation, because SULT1E1 sulfates estrone . Recently, it was reported that an endogenous retrovirus regulates BNC differentiation in sheep [71, 72]. The endogenous retrovirus may have an important role in developing viviparity, trophoblast cell migration and placental development, so the AP-2 family might be related to its expression. Because the appearance of BNC in the trophoblast cell lineage coincides with CSH1 expression [40, 73], the AP-2 family may play a crucial role in trophoblast cell differentiation, remodeling of the endometrium, implantation and maintenance of gestation in bovine placenta. However, the regulation of AP-2 gene expression and the role of AP-2 in bovine placenta remain unclear [74, 75]. Global gene expression analysis was performed on bovine placentomes using a microarray. The genes were partitioned into ten expression-profile clusters by k-means clustering. Some placental-specific genes such as CSH1, PRP1 and PAG1 were assigned to cluster 2. We searched for transcription factors common to the regulation of cluster 2 expression using in silico analysis. The results suggest that the AP-2 family includes such factors. The microarray and in silico analyses provided clues to the regulatory mechanism common to the crucial genes in bovine placenta. Expression of the AP-2 family in the placenta was quantified and localized. It was confirmed only in BNC or mononucleate cells. We deduced that the AP-2 family regulates genes that play a crucial role in placetogenesis. It is also suggested that the role differs for each gene in the AP-2 variants. This research was supported by a Research Project for Utilizing Advanced Technologies (05-1770) grant from the Ministry of Agriculture, Forestry and Fisheries of Japan; grants (Kiban-kenkyu C 17580284; Kiban-kenkyu B 17380172) from the Ministry of Education, Culture, Sport, Science and Technology of Japan; and a grant from the Animal Remodeling Project (05-201, 202) in the National Institute of Agrobiological Sciences. KU participated in the design of the study, carried out most of the experiments and wrote the manuscript. TT participated in coordinating the design of the study. KU, TT, MH, KaKa, KeKi and KH collected the tissue samples. MH and KaKa were responsible for all animal care and the artificial insemination of cows. KU, HI and KeKi carried out the DNA microarray experiments and analysis. KH participated in coordinating the design of the study and helped to draft the manuscript. All authors read and approved the final manuscript.